In an earlier post I outlined how I setup a Sure Electronics LCD screen with my Raspberry Pi 3 using a Python driver. Whilst updating the LCD via command line is immensely useful I decided to build a UI to control the LCD send messages too it. By using a browser based UI I could update the LCD screen from anywhere. Essentially this was a chance to play with a Python web framework and write some code! I’ve passed the UI’s URL round my family’s devices at home and they now send me messages whilst I’m in my study working/playing. The end result can be found in my GitHub repo. Building the server side web framework was easy and logical in Flask and I was able to get something setup in one file which served my needs. However after reading some Flask best practices I spread my solution out into a more appropriate structure. Flask will seem familiar to web developers with experience of ASP.net MVC, Web API, Node/Express etc. You define routes to handle incoming requests. The key aspects my solution are outlined below. I am running the Flask server directly on my Raspberry Pi and using it to serve the pages and host the services for commanding the LCD screen. To install Flask (on a Pi) first install Python Pip (a popular Python Package Manager) via “apt-get install python-pip” or “apt-get install python3-pip” (for a Python v3 specific Pip) and then install Flask via “pip install flask”. Flask comes with a small lightweight development server which runs your app in Dev mode and also auto restarts after code changes. I found this fast and robust enough for my needs. run.py: This is the entry point for the app. When run it calls run in the app file and here I have optionally passed IP/Port I want the app to run on which enables the app to be exposed to the internal network so I can connect from other machines on the network. app/__inti_.py & config.py: This is the app initialisation code and where it points to the config.py file where config settings can be set for the app. app/views.py: This is the heart of the app. After importing the relevant python components and instantiating the Smartie LCD driver (from previous post), the routes for the app are defined. The route for root will just return the text “Home Page” whereas the route for /lcd will call render_template to return a templated HTML page (lcd.html) and passes any relevant data (e.g. “Jeff” which is irrelevant in this example”). Templates will be covered shortly below. Any POST or GET on http://SERVERADDRESS:PORT/lcd/clear will result in the smartie drivers clear screen method being called. A POST to “/lcd/displaymessage” will be validated to ensure that the request contains JSON data and then the data will be passed to the driver for display. 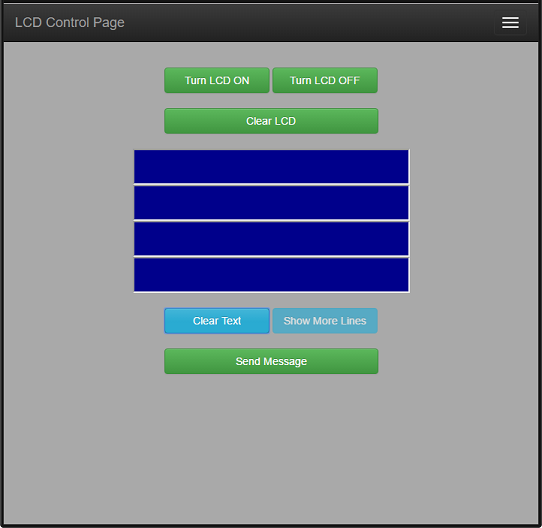 /app/templates/lcd.html: This is the main HTML page that enables the user to type the messages to display. That’s mostly it. Run the app by running the run.py module (e.g in the Python IDLE or terminal) and direct your browser to http://SERVERADDRESS:5000/lcd. The code for my Python driver and this web app is available on GitHub here https://github.com/RichHewlett/smartie and https://github.com/RichHewlett/LCD-Smartie-Web.